Whatever you do…don’t look through the ingredients in this slushy and get all freaked out because there’s spinach in it. Don’t do it. Just relax. There’s nothing to freak out about. I promise you can’t taste the spinach….and this slushy is so refreshing and delicious you won’t even know what hit you. The first time I made these, I was just messing around trying to come up with a yummy way to get more raw greens into our diet. I figured they’d turn out some ugly brown color, since I was mixing red, yellow and green together. I just hoped I’d be able to make my family look past it and enjoy the fruity taste. But instead, they turned out to be a beautiful deep red color…and tasted like fruity heaven. So even though you KNOW there’s spinach in them because you made them and put it there yourself, you will forget all about it while you sit down with a spoon and eat this slushy that tastes better than anything I’ve eaten this entire summer. Put all ingredients into blender. Process until everything is mixed and becomes slushy. And see what my blender did? It made that pretty swirl thingy. My boys beg for me now to show them the pretty swirl thingy everytime I make these. These have become one of our favorite side dishes….or sometimes they are our breakfast. WE LOVE THESE SLUSHIES! I am going to have to try this. We love smoothies and this might me a great way to add some greens to our diet. Spinach is not one of my favorite things to eat. The rest of my family loves it, but I could do without it. :) This is one way I could eat it. Thanks for the idea. Hmm… can I still make these if I DON’T have spinach to add? :-) I know, I know… I need to go buy some. Wait, I have broccoli, will that work? I am all for adding in the green stuff whenever possible. Thanks for the recipe. I’ll be trying it. Oh my goodness. This is definitely one I need to try! Thanks! Okay, you’ve convinced me – I mean, if I sneak carrots into the spaghetti sauce, why not try spinach in a slushie. I LOVE “green smoothies.” I am in the middle of a 30 day green smoothie challenge where you drink one a day. The ratio I use is 40% raw greens/60% fruit. I hate veggies but I LOVE these – you can’t even taste the spinach. I’m going to try your recipe tomorrow. Another variation my family enjoys is strawberry, banana (instead of the peaches) and mango juice instead of water. VERY yummy! and I want to eat them up before they get moldy or too ripe. Maybe my Mr. No Produce baby will drink this? I’m gonna try. Thanks! I’ll give these a try for sure! We do lots of smoothies at our house. I drink those every morning, only I start with a blender packed full of spinach, so mine don’t come out pink. They look … well, they’re green, icky bile green. But you still can’t taste spinach, it just tastes like a yummy fruit smoothie. Oh yeah, and I also add a banana. :D YUMMY! Oh good! And HEALTHY! YAY! Actually, it doesn’t sound freaky at all… yum — I’m going to try them! It sounds really good but what is stevia? I’m headed to the store today and will definitely be buying these ingredients! I have some spinach out in my garden that needs to be picked. I think I will use some of it for this recipe. We love smoothies here! interesting…wonder if I could slide those past the hubby…thanks! this isn’t the first time i’ve heard of putting spinach in smoothies, but i forgot all about it! i may just have to try it :) thanks for the reminder! Ooooh, I can’t wait to try this. I am always looking for ways to sneak veggies into my girls food so this will be great! Thanks for posting this! I am absolutely trying these. We have everything on hand already! I love sneaking greens in wherever possible. Sorry to be the grammar police but alas usually means something bad has happened. I made these for breakfast this morning and they were SO yummy!! I used chard and kale from my garden instead of spinach. Yummy! Thanks for the idea! I came across your blog by way of Rocky in my dryer and wanted to ask if I could use Splenda since I only have this and sugar on hand? Thanks. Spinach in a smoothy? Hmmm…we’ll have to give it a try. Looks like it’s gotten great reviews…thanks for sharing! I look forward to trying it out! Yup, we love spinach in our smoothies too! JediBoy calls them “Hulk Shakes” even though the way we make them most mornings comes out blue. We use spinach, orange juice, flax oil, bananas and blueberries. I’ll have to try peach and strawberries. Yum! This is great! I would like to get more greens (and fiber) into my family’s diet and I was hoping to find some smoothie recipes that fit the bill – thanks! These were delicious! My kids and I all enjoyed them! I am thrilled to see stevia in your recipe!!! I have been using it for years, and share it with friends every chance I get. Always trying to cut back on the refined white sugar. The smoothie looks delicious!!! These are great. Although mine did turn out a funky color and I had to modify it to even get it to mix. I added about another 1/2 c. water, flaxseed, and then added a banana too after I realized it wasn’t going to be the pretty red that yours are in the picture. I still love that my son who loves smoothies but hates veggies will drink this. Very sneaky! Love it! I tried making these for the kids today. For some reason the spinach did not blend in all the way and there were visible pieces. I could still taste the spinach. I even tried putting it in my food processor. My kids would not even try it. The 1 year old did after I watered it down and put it in a sippy cup. I wonder if it is because all I had was frozen spinach. It tasted ok. I think I will have to try again. I like to hide veggies in the kids food. Wow…you got a lot of comments on this one. This recipe looks awesome…I use spinach in my smoothies too!! I love sneaking it in, and no one ever knows! Thank you for this recipe! It was great! We had to add a banana though, it was alittle too sweet for us. I have been kinda lingering on the outside of your website I really love alot of your ideas but not sure if I want to go all the way yet.. haha. We are taking it alittle at a time. Thank you for taking the time to put all of this out there! I found your site yesterday and have spent a few hours looking around….LOVE IT!!! As a nutrition major, this is after my own heart! My son (also named Asa) loves loves loves smoothies! I always want to try spinach in my smoothies but then forget about it when the time comes. We’ll try your recipe out…sounds like a good summer heat cure. I made mine without the green (don’t have any). I also froze it like the pineapple orange slushies. It was awesome with my pizza pockets! Is there anything you could use instead of Stevia? Laura, do you need to add sweetner? You don’t have to add a sweetener, but my kids prefer the slushie if I’ve added a little something. You could use a little sucanat or honey or maple syrup and it would be just fine! If I need sweetener, I use honey. I am not a fan of stevia, it just tastes funny to me. You might try it without sweetener first though. I think it depends of the flavor of your greens. Sometimes the spinach is so mild or the fruit so sweet that it isn’t necessary. I make smoothies almost every day and I always put some spinach in them. You are right, if you figure out the amount of spinach, it is completely tasteless! I add some yogurt to ours, adds some calcium and takes care of the sugar aspect too! Vanilla yogurt is my fav. We finally tried the spinach slushie recipe. We could taste the spinach but it was good. I’ll definitely make this again. Was refreshing and healthy. Thanks! I’m sipping on one right now and it tastes great. I followed your recipe except that I used raw honey in place of the stevia (it’s what I had). I make all kinds of fruit smoothies for the family but have never had this combo, it’s a nice change and definitely a keeper. I have everything but the spinach! I’ll have to make this sometime this summer. Can you use frozen spinach in these as well with the same results? That’s all we can get for spinach here. I’ve already done it in smoothies before, but I can’t figure out how much to use. They come in frozen little balls. Strange, huh? Thanks for pointing yourself back to this recipe, I’ve forgotten about it. Yes, you can use the frozen spinach, for sure! Another idea – Shoshanna Pearl of Bulk Herb Store uses 2T of orange juice concentrate (this is the frozen can you use to make orange juice) as the “sweetener” in her smoothies. I have found that this is plenty sweet for my family! Also, I take kale or spinach and fill a blender with it and then add about half a blender full of water and then blend until smooth. You can freeze in ice cube trays for a really “cold” smoothie addition! Nice because I don’t always have fresh “greens” on hand. Have a great day, Laura – My daughter and I love your blog! I am drinking a green smoothie right now! One way to help get the spinach to mix clear in is to add your liquid and spinach and blend until it is smooth. Then add your frozen ingredients. We love these and my children know there is spinach, herbs, flax etc. They think that is what it takes to make them so good ( : Sometimes we add a spoonful of orange juice concentrate to sweeten them. We think that it has to have a banana! That really helps hide the spinach flavor. Also, frozen spinach does change the texture of the smoothie but it does work. I did almost this the other day! :O) I had a package of frozen peaches and some fresh strawberries and a half-pint of cream… YUMMY! After I made it and was drinking this heavenliness, I was wishing that I would have had some spinach on hand to have thrown in!!! How funny that our “recipes” were almost identical. I *would have* put the spinach in had I had it. The only real difference was that I used cream in place of water. I don’t know if your Stevia is plain or not, but I used a berry flavored one in mine. Try this recipe with cream (or I suppose you could use milk, but, oh, cream – YUM! ;) and I’m certain you will love it even more than you already do!!! Good to know you can do this without the milk/cream/yogurt/etc. that seems so common in these recipes. Instead of water in our smoothies, I use decaf green tea to add more antioxidants. I like trying to add more healthy stuff where ever possible. Can you use any frozen fruit? I have tons of frozen strawberries, bananas, blueberries and raspberries but no peaches :( Also, I don’t have any Stevia drops yet. Could I use some Truvia packets? If so, how many? Just to taste? Sure – any fruit will work! I don’t know much about Truvia, so I’m not sure how to advise. I just tried your recipe using fresh bananas and strawberries along with a cup of fresh spincach. I also used 1/2 tsp. of premium raw Demerara cane sugar. Along with a cup of water and a few ice cubes. Yummy!! I will definitely be using this when the grandkids come to visit (10 grandkids). Great way to get fresh fruits and fresh veggies in their growing bodies. This look delicious! My son loves raw spinach! Oh! That sounds SO good. I am going to make strawberry something sluches. I am dripping with sweat already. So HOT out. 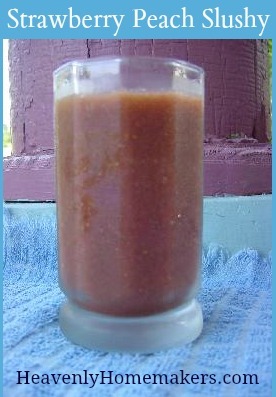 I like frozen banana blended with any fruit or cocoa powder to flavor. No sweetener needed. I put a dollop of Plain Greek yogurt on top and sprinkle walnuts on. Yumm! routine of smoothies. Having a difficult time however with getting protein. Started using a protein powder, this helps somewhat. But it does affect my hormones levels without the milk product for protein. My naturopath gave me some over the counter stuff will see if this helps. Anyway this is the way to go as far as my diet is concerned. Have had three strokes and doing great on these veggie drinks. Thanks again for the recipes. I wish I could give you some of mine. But I just throw what I can get up here in Northern AZ. We don’t get to much good fresh fruit and veggies unless it’s frozen or we grow our own, not a gardener. That’s the way of it in rural areas. Enjoy reading the smoothie or green slusy recipes.